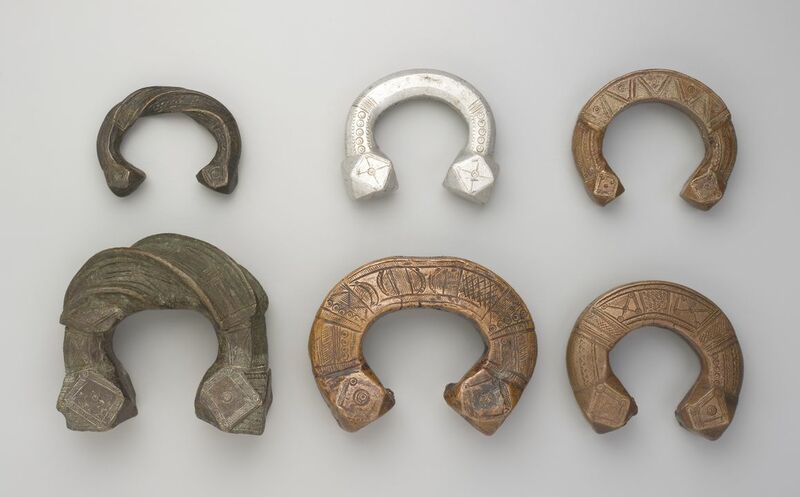 Six indigenous manillas, five are copper alloy bracelets and one aluminium, of horseshoe shape with incised geometric and abstracted design motifs, as well as polyhedron termini. Four have essentially square shanks, one, a physically twisted shank and one, a moulded twisted shank. -2/1 Manilla, copper alloy, polyhedron terminals, twisted shaft with geometric patterning. -2/2 Manilla, copper alloy, rectangular cross section, strong banding, cross hatching, circular design motifs, polyhedron terminals. Decorative detail varies from front to back. -2/3 Manilla, copper alloy, geometric patterning in serpentine and zig-zag configuration. Side A differs from side B. 2/4 Manilla, aluminium, rounded edged hexagonal cross section. Decoration consists of banding and circles on the arms and terminals only. -2/5 Manilla, copper alloy, twisted square cross section, geometric designs follow the twisted form. -2/6 Manilla, copper alloy, cross section of the central shaft is square and on the arms is rounded. Decorative elements differ on front and back. These indigenous manillas were made using the lost wax technique. This involves firstly making a model of the object in pure bees wax at which stage the basic form and design is determined, with decorative detail generally stamped or incised into the metal later. The wax model is then covered in clay mixed with organic substances such as hair or fibre. This is initially applied thinly and is combined with charcoal powder which vaporises when heated and in so doing prevents the formation of air bubbles. Each layer is dried before a new layer is applied. Wax rods extend from the model and melt when heated to facilitate the passage of molten metal which fills the void left by the wax. The clay mould is broken when cool and thus can only be used once. Nigeria in association with the federal Department of Antiquities, 1979. Fisher, Angela. Africa Adorned. New York: Abrams, 1984. Quiggin, Alison Hingston. A Survey of Primitive Money: The Beginnings of Currency. Johansson, Sven-Olof. Nigerian Currencies: Manillas, Cowries and Others. These six decorative native manillas are part of a collection comprising twenty six manillas in total. They were collected by the donor and purchased from a scrap metal merchant in Apapa (the port and industrial area of Lagos, Nigeria), between 1964 and the end of 1966. At the time the donor held the position of the Australian Trade Commissioner, and was stationed in Lagos from August 1963 to March 1964 and January 1965 to December 1966, and also in Accra, Ghana from May 1964 to January 1965. The exact origin of manillas is uncertain. Discussion surrounds their possible derivation. Theories vary from their similarities to bronze Celtic torques speculatively recovered from shipwrecks off the Nigerian coast, to having their origins in the penannular ring money used by the Egyptian, Carthaginian or Phoenician explorers in ancient times. They were initially intended as currency bracelets and ornamental use. Over time the manilla developed into a smaller, unadorned, currency medium used for barter. These typically were made in large numbers in England, Portugal and Belgium for use within Africa and were withdrawn from circulation towards the end of the 19th century with the introduction of conventional British-style currency. Limited quantities of native manillas continued to be used for customary purposes such as dowry payments and burial wealth although this practice is in decline. The word manilla is derived either from the Spanish for necklace (monilia) or from the Latin for hand (manus). (Johansson, Nigerian Currencies: Manillas, Cowries and Others, p.11). The purchase price for each manilla was dependent on both the weight of the bracelet and the value, at the time, of the metal from which it was composed. Prior to acquisition by the donor, the manillas were purchased by contacts of the Apapa scrap metal dealer whose responsibility it was to travel to rural villages and buy back manillas. After manillas were withdrawn from circulation in 1949 villagers were allowed to keep only small numbers for ceremonial customs. The manillas collected were stored in the merchant's yard in mounds up to 3.5 metres high.